In an extraordinary move on the day before the US Senate’s Christmas recess, two Democrats sided with right-wing Republicans to introduce the so-called NICA Act which, if passed, would require the US government to veto loans from international financial institutions to Nicaragua. While it is still a long way from becoming law, the bill suddenly looks like a more serious threat to that country’s social progress. Republican Congresswoman Ileana Ros-Lehtinen, long hostile to progressive governments in Latin America, originally sponsored the bill. It was not surprising when it got support from other right-wingers like Senators Ted Cruz and Marco Rubio. But now Senators Leahy (D-VT) and Durbin (D-IL), who have both been prominent in challenging US support for the right-wing government in neighbouring Honduras, have put their names to the NICA Act too. Why is it being promoted? Ever since the former guerrilla leader Daniel Ortega won election for a new term as president of Nicaragua in 2006, he has faced renewed hostility from the United States, even though of a much softer form than was the case during the Contra war of the 1980s. His opponents focus continually on his supposed grip on power, especially after the courts overturned a constitutional ban on presidents running for second and subsequent turns of office. Their frustration intensified when his wife Rosario Murillo became his vice-president after the last national elections, even though she has been a key figure in the government from the start. Most recently, his critics focussed their attention on the arrangements for last November’s municipal elections, in which Sandinista mayors were returned in most towns and cities. It was because of the supposed bias in the electoral process that the proposed NICA Act was conceived, and which it was intended to address. The timing and purpose of the Senate’s support for the bill are both curious. First, the municipal elections are over, the results were unsurprising and the Organisation of American States, who observed the polls, concluded that the outcome was fair even though they had various recommendations for improving the electoral process (since accepted by the government). Opposition representatives lobbied in Washington in support of the NICA Act, which given freedom of speech in Nicaragua they are allowed to do, but in many countries would have seen them arrested for treason on their return. Third, no one who knows Nicaragua believes that the opposition to the Ortega government would have had any chance in elections anyway: they consistently receive only tiny levels of support in independent opinion polls compared to the government’s two-thirds or higher. Nor has the opposition ever had a credible programme other than its opposition to Ortega: indeed, its own representatives lobbied in Washington in support of the NICA Act, which given freedom of speech in Nicaragua they are allowed to do, but in many countries would have seen them arrested for treason on their return. Of course, there are political controversies in Nicaragua, not least because of its planned interoceanic canal. Open Democracy / DemocraciaAbierta has published pieces by Luciana Téllez Chávez, Robert Soutar and others, arguing that the government has become more authoritarian in trying to push the project through, criticisms which I have argued are more to do with a broader frustration with the failure of opposition politics than with the environmental and human rights consequences of the canal itself. But in any case this is irrelevant to the consequences if the NICA Act became law. It would mean that the US would vote against loans from international financial institutions until Nicaragua has, in the US government’s judgement, taken effective measures to "combat corruption and promote democracy, free speech, civil society and rule of law". Quite apart from the effrontery and hypocrisy of the US adopting such a role given its stance on Honduras and elsewhere, who knows how long this might take? 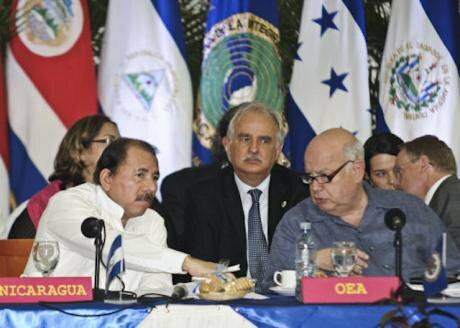 How does the Nicaraguan government use the support it gets from international institutions? One example is a current World Bank project that improves access to health services and strengthens land rights. Both the World Bank and IMF, where US officials would vote against future loans, have announced new support packages for 2018 while praising Nicaragua’s effective use of past loans. Nicaragua was one of the first countries in Latin America to achieve the UN millennium development goals for poverty reduction. Apart from specific projects, the Ortega government has used the budgetary support it receives to reduce poverty, dramatically improve the school system and develop its health services. Its achievements over the last decade are simply undeniable: for example, Nicaragua was one of the first countries in Latin America to achieve the UN millennium development goals for poverty reduction. Texas Democratic Vicente González was the only member who opposed Ros-Lehtinen's bill during floor debate. He pointed to the fact that few Nicaraguans migrate to the United States because of its government’s success in tackling poverty, drug smuggling and wider crime, in contrast to the countries between it and the Mexican border. Nicaragua is now one of the safest countries in the hemisphere. "Enacting this bill could have serious consequences in the region," González said. "How can we in good consciousness support a measure that would punish the poorest country in Central America?"